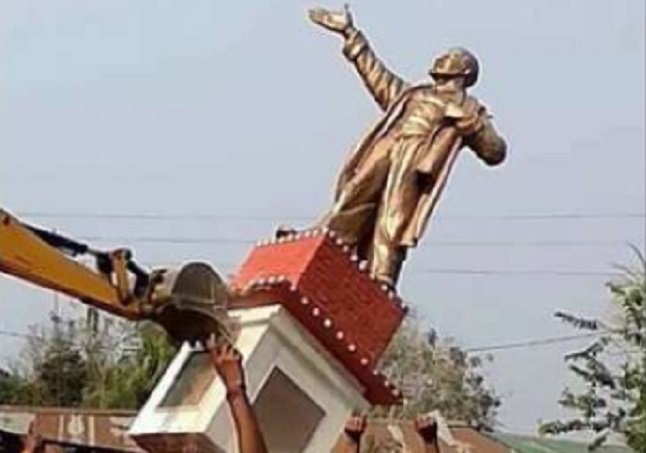 The reprehensible acts by the Tripura Hindutva goons of razing statues of Lenin who led the greatest October Socialist Revolution in 1917 and was the only head of a state (USSR) who supported the Indian freedom struggle, should not surprise anybody. Large number of revolutionaries like Bhagat Singh, Rajguru, Sukhdev, Chandershekhar Azad, Ashfaqullah adopted socialism as their creed and died dreaming of independent India on the model of USSR. The slogan, INQUILAB ZINDABAD coined by Maulana Hasrat Mohani and popularized by Bhagat Singh and his comrades was inspired by Soviet revolution. The Hindutva goons love Swami Vivekananda but do not bother what he said about Socialism. He said: “I am a socialist not because I think it is a perfect system, but half a loaf is better than no bread.” Before his death in 1902 he was aware of Lenin led, CPSU; Russian Communist Party’s fight for revolution and commented that the first Proletariat revolution would take place in either Russia or China. We must know why a great liberator and unwavering supporter of India’s independence, Lenin is being targetted by the Hindutva goons. It is being done because Hindutva goons are genetically opposed to democratic-secular India which came into being after a long glorious anti-colonial freedom struggle. Those who razed the Lenin statues (Tripura Governor, an old RSS cadre justified the criminal acts) are the children of those pre-Independence RSS/Hindu Mahasabha [HMS] leaders who brazenly opposed the freedom struggle. These criminals aligned with the Muslim League [ML] against the Quit India Movement of 1942. When whole of the Congress leadership was in jails, Indian masses were being massacred for carrying Tricolour and India had been turned into a jail by the British masters, HMS led by Hindutva icon, Savarkar ran coalition governments with ML in Bengal, Sind and NWFP. Shamefully, another Hindutva icon, Syama Prasad Mookerjee was the deputy CM in the Bengal ML ministry. When Netaji attempted to liberate India militarily HMS in league with the RSS organized ‘Military recruitment camps for the British armed forces’. It is not known by many that Indians lost 1857 War of Independence mainly due to the support of Gurkha army sent by the Hindu rulers of the Hindu State Nepal. For this support Terai region of India was gifted to Nepal by the British government. What else can we expect from the children of such anti-national goons? This hatred for Lenin is the continuation of the hatred against MK Gandhi who was killed by the Hindu nationalists for the crime of favouring a non-theocratic India. Our PM who never misses a congratulatory tweet on the birthdays of world leaders and their family members wrote no tweet on this issue. However, home minister Rajnath Singh, another senior RSS cadre disclosed that PM had told the former that PM had condemned razing of Lenin’s statues in Tripura but was silent on the shocking support to the razing of statues by Tathagat Roy, Governor of Tripura who in the absence of a ministry is the actual administrator of Tripura. As Indians we know that our PM shows his unhappiness for the consumption of the liberal world. Our dear PM condemned lynching in the name of cow, even described the perpetrators as anti-social but Hindutva criminals continued lynching. PM condemned violence against Dalits (even asking the perpetrators to hit him instead of Dalits) but incidents of violence against Dalits increased in some states ruled by RSS/BJP by 300%. PM in the presence of Jordanian King advised Muslims to adopt moderate Islam but RSS Boss, Mohan Bhagwat at the same time asked Hindus to adhere to HARD-LINE HINDUTVA and declared India to be land for Hindus. Even after red flagging by PM the RSS/BJP leaders demanded razing of Periyar’s statues in Tamilnadu which was in fact done. In UP ruled by his favourite Mahant Adityanath statue of Dr. Ambedkar was smashed.